The Minnesota Vikings kicked off the NFL Thanksgiving festivities with a 30-23 win over the Detroit Lions Thursday, the team’s seventh win in a row since starting the season 2-2. The Vikings jumped out to leads of 13-0, 20-3, and 27-10 before holding off a late charge by the Lions. Minnesota got two touchdowns from TE Kyle Rudolph in the first half, which were answered on the Detroit side by two scores from WR Marvin Jones. The Lions’ comeback was curtailed a bit in the fourth quarter by a lower-leg injury to QB Matthew Stafford, suffered as he threw Jones’ second touchdown, and a late potential game-tying touchdown was nullified by penalty. While his counterpart on the Detroit sideline struggled with accuracy, Keenum continued to confound those waiting to see him falter and turn control of the offense over to Teddy Bridgewater. Keenum was on point and superb at managing pressure and evading sacks to keep the Vikings’ offense on schedule. 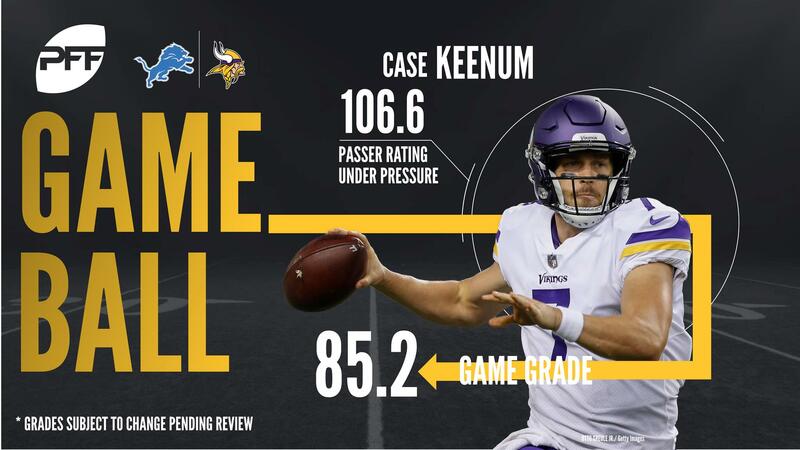 Keenum’s willingness to stand in against pressure saw him pick up a touchdown pass to Kyle Rudolph on a play he got hit on, helping boost his passer rating under pressure on the day to 106.6, his third game with a passer rating over 100 under pressure this season. Keenum’s go-to receiver was, once again, Thielen. The Vikings’ big slot receiver collected his eight catches against six different Detroit defenders ranging from defensive end Kasim Edebali to second-round rookie corner Teez Tabor, featuring in only his fourth game of the season. Thielen, Stefon Diggs, and Kyle Rudolph all topped 60 yards receiving, and for the control they had over the Detroit linebackers and defensive backs it is perhaps puzzling the game was so close. New dad Griffen got off to a fast start and was a threat throughout against Detroit LT Taylor Decker, featuring in his third game back from injury. Only one of Griffen’s sacks was on Decker (on the other, Stafford drifted out of the pocket) but Griffen still got the better of this matchup. Griffen’s six pressures (2 sacks, 1 hit, 3 hurries) were a third of the Minnesota pass rush’s total production and marked the fifth time Griffen topped 5 pressures in a game. Racking up one hit and five stops on defense, this was one of Barr’s most productive games of the season, only his seven stops against the Ravens beats his Thanksgiving production. Three of his stops came in coverage and he showed his range in the fourth quarter covering for a blitz by slot corner Mackensie Alexander to corral Golden Tate from behind for a short gain. Jones’ third 100-yard game of the season was highlighted by arguably the play of the game, with the receiver going up over both Terence Newman and Xavier Rhodes to bring in a long score on a free play with the Vikings playing with 12 men on the field. Jones took some of Rhodes’ best shots in coverage and still came up with big plays on a back-shoulder throw in the third quarter and displayed his physicality to pick up good yards after the catch early in the second quarter as well. Jones has upped his game since Week 6 and Lions fans will hope for more to come down the stretch. When Stafford is on point he’s a joy to watch, and there were glimpses of that Thursday. Overwhelming from start to finish, though, this was a scattergun performance from Stafford with some of his worst accuracy of the season. Stafford had 10 incompletions due to inaccurate passes, including an overthrow to Golden Tate that could have tied the game in spite of his struggles. Those 10 inaccurate incompletions on 35 targets comfortably made for Stafford’s worst inaccurate rate of the season. Davis was not targeted in coverage for the first time in his career and with that weaker area of his game not coming under scrutiny his run defense shone in his best performance of the season so far. Davis picked up a season-high five defensive stops and didn’t miss a tackle for the first time in his career. Other teams will continue to isolate and test Davis in coverage, but with his struggles hidden there for a week, Davis showed what he can do against the run. After being kept quiet against the Bears last week and with Dwight Freeney‘s arrival with the Lions yesterday Zettel rebounded with his eighth multi-pressure performance of the season. His five pressures (1 hit, 4 hurries) tied his third-most pressures of the season, though on the downside his three missed tackles set a new season-high with two of those misses coming behind the line of scrimmage.